Why are Atheists so on the attack against Christianity lately? 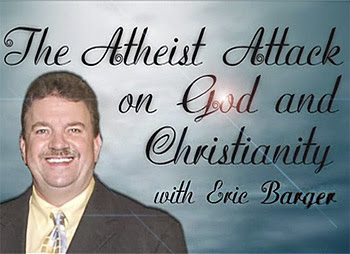 Nathan Jones: Eric, it seems like the Atheist are coming out of the woodwork lately kicking and screaming, surging and attacking Christianity at every opportunity. Why the sudden uptick in attacks? Eric Barger: Controversy raises enough money to promote their books and then their TV interviews. Also suddenly, Atheists are feeling emboldened because they are being fed by particular big name speakers such as Richard Dawkins. I think those reasons just partly account for their aggresiveness. I can't help when we talk about something like this phenomenon to bring up the idea that if indeed we are living in the end of the end times then this kind of anger towards God is going to be promoted. This behavior is part of the activity that is beginning to take place in the world for the purpose of dragging people away from God. Dr. Reagan: That's a great point. It's part of the end time deception. Nathan Jones: It's like the Christian message is out there, but Satan is heaping on all these other messages screaming and yelling for people's attention in an attempt to drown out our Christian message. This satanic strategy results in the Atheists screaming louder than ever. Eric Barger: Yes, we see the rise of the cults and of the occult. Certainly we are witnessing a rise of Atheism. I too think Atheists are getting louder. However, if you examine people who have gotten into the New Age philosophy, many of them claim to have once been an Atheist but just added the spiritual dimension to their thinking. Regardless, they didn't come to Christ. They still are dark of heart. Dr. Reagan: I find it somewhat ironic that people who absolutely deny that God exists spend so much of their time railing against God. Eric Barger: They in reply would say, "Look at these Christians spending all this time and effort and money on TV to prove there is a God." So, see? They go the other direction with that argument. That much effort to fight against something they don't believe in comes down to the point that Atheists have got to try and disprove there is a God so they can continue to feel good about the evil way in which they live. Dr. Reagan: That point you keep coming back to is a very important point. The bottom line I am convinced in that most of these people do not want to admit there is a God because if they do then they're responsible to someone. If you look at the history of the great humanistic thinkers of the 20th Century and 19th Century, they lived like ally cats. They were just the most immoral people you could possibly imagine because they didn't feel they were responsible to anyone. They lived the way they wanted to. Nathan Jones: The most refreshing email I ever got was actually from an Atheist. Atheists write in trying to debate all the time. They come with all these supposed facts and disputes. Well, this one Atheist was railing and swearing at me, then oddly, he finally stopped. In what became a moment of clarity he said, "Okay, I believe there is a God. I just don't like the idea that it is either Heaven with Him forever or Hell." Then this man asked, "Why can't there be a third option? Why can't God just leave me alone and give me a third option." From there he fell back into his wild craze again. I really think at least for the Atheists that I talk to, they really do believe there's a God, but they don't want Heaven or Hell. They want God to leave them alone. And, sadly, that's part of what Hell will be about. Eric Barger: I don't think we need to check our brains at the door. I tell Christians we've got to have our eyes open. We've got to be reading the Bible and we have to understand what the attacks are around us. But, I think a lot of this antipathy is because people just want their own intelligence and their own ideas to rule. Every once in a while I hear that same kind of truth come from then, which is, they want to be their own God. In the third segment on why Atheists think the way they do, we'll explore if Atheists are correct that because there is so much evil in the world therefore there cannot be a God. My heart aches for unbelievers.. and i pray often for a fresh awakening here in our country. On the bright side... we know the HS is hard at work especially in places like the middle east where thousands r coming to Messiah daily.